Don’t want to be part of a state where the Assembly voted 68-0 to name a bridge after Willie Brown? Willie Brown? We’re outta here. A state where some people are actively debating whether “performers” in dirty movies should be required to wear condoms? Enough already. Do you see a trend forming here? 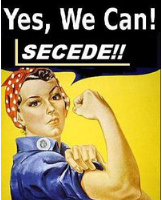 I’m talking about secession, friends. The folks up there in Siskiyou County, or at least four of the five members of the Board of Supervisors, seem to think it’s a fine idea. Too many soft-headed liberals in the rest of the state want to take away their guns, OK gay marriage, and God knows what else. Although they are at opposite ends of the state, the secessionists are united by anger at what they perceive as Sacramento’s neglect. In a state of almost 38 million people, the 45,000 residents of Siskiyou County don’t swing a lot of political clout, and the South California advocates are unhappy with being part of what they regard as an overly liberal place that includes, for God’s sake, San Francisco. Your first thought might be that these are two more examples of the polarization that has befouled American governance of late, and you’d be right. We have more than 125,000 people in Texas signing a petition (well, making their Xs) advocating secession from the United States. Secession petitions have circulated in Alabama and Louisiana as well. And a group of counties in northeastern Colorado want to do a Siskiyou and form their own state. It’s mostly rural areas resentful of city slickers who get their way in the legislature and Congress, never mind the concerns of farmers and hunters. It’s even gone international, with the heathens in West Bengal wanting to form their own new state, Gorkhaland. They’ve barricaded streets in Darjeeling. Police have made arrests. “Demands for more than two dozen new states have burst into mutinous life …” reports The Associated Press. 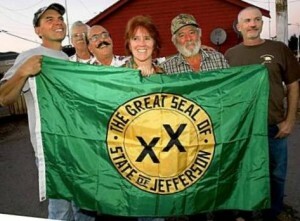 State of Jefferson In California and Oregon, it’s the resurrection 71-year-old idea. Back in 1941, the southern Oregon counties Curry, Josephine, Jackson and Klamath wanted to join with the California counties of Del Norte, Siskiyou, and Modoc to form the State of Jefferson. It all ended with Pearl Harbor on Dec. 7, 1941, but even today, if you look to the right while traveling north on I-5 in Siskiyou County just below the Oregon line, you can see a big old hay barn that since 1998 has had “State of Jefferson” painted on the roof. None of it is going to happen. The Oregon and California legislatures would have to approve (fat chance) and the heavily Republican new State of Jefferson would be entitled to two U. S. senators. There is no way the U. S. Senate, currently ruled by Democrats, is going to approve the addition of two more Republicans. It’s all an indication of what seems to be a growing phenomenon — people in some parts of the country — the world — feeling they’ve been left out, that they would do better with their own smaller, more homogeneous political subdivisions. The world is getting to big, too complicated, too disdainful, too remote. Barack Obama doesn’t belong in the White House. Lawyers won’t let kids pray in school. Welfare queens are robbing us blind. The country has 47 percent takers. No one wants to earn an honest living anymore. 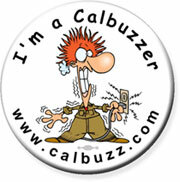 One can sympathize, even if common ground seems to be dwindling in the face of more and more self-righteous ideology. There are no realistic answers in the immediate future. But at least we in the media are having a wonderful time. Chuck McFadden covered politics for The Associated Press in Sacramento. His biography of our very own governor, Trailblazer: A Biography of Jerry Brown is out from the University of California Press.